The old House of Correction fronting onto Burgage Green in Southwell was erected in 1807/08, replacing an earlier building which had fallen into disrepair. The new building was designed by the architect Richard Ingleman and was erected at a cost of £2112 on a site a little removed (around 80 yards) from the old prison, where previously had stood a brickyard. Writing in 1818, R.P. Shilton in his History of Southwell records that the old prison was demolished and such materials as were still serviceable were incorporated into the new building 'down the road'. The main frontage (pictured) was of Mansfield stone, "rusticated" says Shilton, "in the highest degree of workmanship..., [presenting] at once a face of solidity and elegance". "The entrance.... is into the lodge, which first presents a passage, or Turnkey's room; on the left hand is a room containing a bath, optionally hot or cold; a fumigating oven for the purification of infected garments; and a copper for the governor's use. "On the right is another room for the Turnkey with a fireplace and staircase. "On the second floor [ie the first floor to us] are two reception cells for prisoners, until they have been examined; or for those who arrive in the night; also a bedroom for the Turnkey..."
Behind the main reception building (pictured), 68ft along a flagstone walkway, stood the Governor's house, irregularly octagonal in shape, which also contained a chapel. The chapel was for use by both staff and inmates, "wherein", notes Shilton, "the pews are admirably constructed for separation of the sexes". Three "framed bridges" connected the chapel with the three wings of the prison, each of which radiated from one of the long sides of the Governor's house. Herein male and female prisoners were kept strictly separated, and each ward had its own exercise yard with a stone bench and water trough in which the prisoners might wash.
From his house, the Governor overlooked each of the three wards and could see into all three yards - although, by an ingeniuos arrangement of wooden slats, the prisoners could not see him. 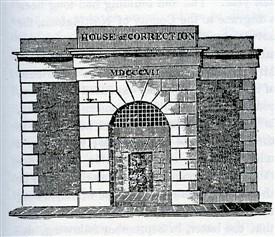 The House of Correction was built in 1808 near the site of an earlier 17th century House of Correction. This resulted from the appointment of Rev. J.T. Becher as Visiting Magistrate in 1806. He adopted the humane rules urged by John Howard, the prison reformer. 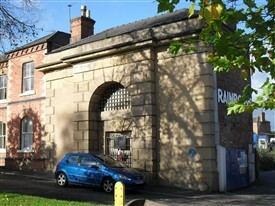 The architect, Richard Ingleman, designed the building around three prison wings with a Governor's House in the centre. the entrance lodge, the boundary wall, and part of an old prison wing remain to this day. 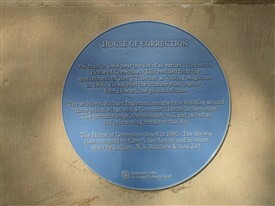 The House of Correction closed in 1880. 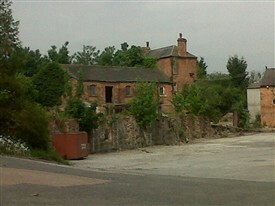 The site was then occupied by Carey's lace factory and in recent years by hauliers W.A. Rainbow & Sons Ltd. This page was added by Website Administrator on 31/12/2013. One of the earliest prisoners there was Byron's first valet, William Boyce, who was caught stealing silk stockings. He also bought a dud horse for the teenage Byron, keeping the change for himself. He was tried in Nottingham and sentenced to transportation, a servant robbing his or her employer being considered a very serious crime. After serving his 14 year sentence he stayed on in Australia, becoming a respectable and respected citizen. The following is from an unidentified newspaper clipping with the date 'Aug 3 / 1912" written on it: "The death of Mr William Lane of Station Street Southwell has removed from the town one of the few remaining links with the past... Bornb on July 1th 1820... [he]... was a turnkey at Southwell prison which is now part of Messrs. Carey's lace factory, the building ceasing to serve as a prison over 30 years ago. The discipline in places of detention was of a very different character then to that whih is in vogue to-day, and Mr Lane, who had among his duties the post of flogger to fill, ould have related many incidents, some of a sad and others of a humerous kind".